Ableism is discrimination against people with disabilities, including the expression of hate for people with disabilities, denial of accessibility, rejection of disabled applicants for housing and jobs, institutionalised discrimination in the form of benefits systems designed to keep people with disabilities in poverty, etc. 1. Ableism has a dictionary definition. The Oxford English Dictionary traces the world ableism back to 1981; likely the word was in use amongst activists before then. [< ABLE adj. + -ISM suffix, after RACISM n., SEXISM n.2, etc. Compare ABLEIST adj., and also earlier ABLED adj. 2, ABLED n.] orig. U.S. Discrimination in favour of able-bodied people; prejudice against or disregard of the needs of disabled people. 1981 Off our Backs May 39/1 ‘Ableism’that is, the systemic oppression of a group of people because of what they can or can not do with their bodies or mindsis the result of..ignorance. 1993 R. HUGHES Culture of Complaint iii. 162 But certainly clause (3) made it clear that he was against racism, sexism, ableism, lookism and any of the other offences against social etiquette whose proscription by PC was already causing such mirth and laughter among the neo-conservatives. 1994 Canad. Woman Stud. Fall 92/2 Just as there is racism in the feminist movement, there is also ‘ablism’. Able-bodied women have not fully accepted women with disabilities. 2006 C. OYLER & B. HAMRE in C. Oyler Learning to teach Inclusively viii. 145 Although racism and sexism..are recognized as serious challenges to fairness, equity, and democracy,..ableism is often not even acknowledged. I mention the dictionary definition because people often claim that ableism is a made-up word that internet activists created just to annoy them, as opposed to a word with history that people with disabilities ihave been using to define their experiences for at least 30 years. 2. Ableism can be deliberate. A. The Canadian Government went to court so they could continue to make their web content inaccessible to screen readers. C. Where’s the Benefit has spent the last few months detailing out how cuts in spending will affect people with disabilities. It’s hard to pick just a few examples. How about the Member of Parliament who declared that anyone who was on Twitter too much wasn’t really disabled. Or what Disability Living Allowance (DLA) actually does being misrepresented by both the government and the press? ‘I’m sorry,’ she said but I interrupted. 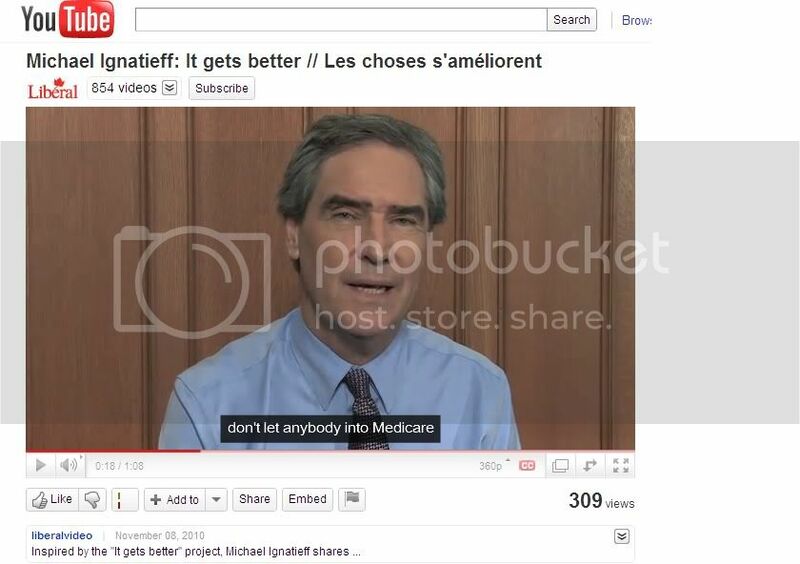 Image description: Michael Ignatieff (older white dude in a sensible blue shirt and tie, his hair a bit windblown) with the caption “Don’t let anybody into Medicare”. Actual quote: “Don’t let anybody intimidate you”. 3. Ableism has an academic definition. Ableism is a form of discrimination or prejudice against individuals with physical, mental, or developmental disabilities that is characterized by the belief that these individuals need to be fixed or cannot function as full members of society (Castañeda & Peters, 2000). As a result of these assumptions, individuals with disabilities are commonly viewed as being abnormal rather than as members of a distinct minority community (Olkin & Pledger, 2003; Reid & Knight, 2006). Because disability status has been viewed as a defect rather than a dimension of difference, disability has not been widely recognized as a multicultural concern by the general public as well as by counselor educators and practitioners. Laura Smith, Pamela F. Foley, and Michael P. Chaney, “Addressing Classism, Ableism, and Heterosexism in Counselor Education”, Journal of Counseling & Development, Summer 2008, Volume 86, pp 303-309. You can also get a degree in Disability Studies. There is a Disability History Association. There are several academic list-serves dedicated to discussion disability. You can go to disability-studies focused conferences. You can go to Deaf-studies focused conferences. You can get a degree in Deaf Studies. You can read a wide variety of academic books that discuss the history of ableism. Or you could read people talking about their lives on their blogs. There are a lot of blogs where people talk about experiencing ableism. 4. Ableism can be accidental. This doesn’t make it okay. A. I don’t think Google woke up one morning and decided to make some of their products completely inaccessible to certain users. I know they managed to pull it off anyway. B. I don’t the mainstream media woke up one morning en masse and decided to ignore protests in support of the Community Choice Act. I know they managed to do it anyway. More than once. C. I don’t think Canada’s Minister responsible for Disability-related issues deliberately sought out a wheelchair-inaccessible space for her constituency office. I do think continuing to have it 7 months after this was pointed out to her in Parliament is deliberate, though. Awesome. I did not know about the history of ableism (and have, in fact, had no argument to counter know-it-all people who say it’s just a “made up internet word”), and am glad to know it. I’ve been doing some reading, but there’s always more to read, always more to know. Great post, Anna! I might add that people with invisible disabilities experience ableism, too (in the form of “I hate when able-bodied people take the stairs” attitudes, because people don’t realize that someone might have a chronic pain condition, or take a medication that has the side effect of unfortunate sweating for a mental health issue). I gave a very brief definition with some links, but I wasn’t satisfied that any of the links gave a full, yet clear, definition. And it was clear to me that my definition was not complete enough when the poster replied that what she experienced went beyond ableism (as I’d defined it), because she experienced (…), which was a classic example of ableism. But it’s off-topic for that list, and I felt too tired to go into education mode, so I let it be. However, NEXT TIME the topic comes up, I can just offer this handy-dandy link that I’ve bookmarked. Thank you! It’s also worth pointing out that for some disabled people, especially in the UK, the word ableism is considered discriminatory. Blogging Against Disablism Day became such such because I’d never heard of ableism when it started, five years ago. However, some people feel that “ableism” makes disabled issues about “able-bodiedness” or the lack thereof – as in your dictionary definition – and therefore, it is sometimes argued, excludes a great number of disabled people from their own experiences and helps enforce a hierachy of impairment. Of course, this is part of the quagmire of the language of disability, and people are (and have every right to be) very wedded to the words they use – Dave Hindsburger prefers disphobia, which has its merits too. But I thought it was worth mentioning as part of the discussion of the word. I generally try and go back and forth between people with disabilities and disabled people. I like the way disability is talked about in the UK (… when it’s not about how disabled people are workshy and stuff about how they can’t possibly be really disabled when they’re on twitter). The UK and its broader embracing of the social model of disability is a big part of the reason why Don stopped being afraid of being disabled. It’s also where the doctors he was seeing wanted to give him tools to make his life easier rather than constantly suggesting he should just try harder. And it’s also the first place where people treated my mental health condition like it was actually something to take seriously rather than dramatics on my part. Thank you so much for this post. I feel like getting ableism recognised and understood by more people is a big part of helping them understand the fact that individual injustices are part of larger systemic ones, and that the disability issues we try to communicate to able and disabled people are as relevant as they are. This will be a really, really useful page for people to link to.